This week's theme is: TURKEYS! 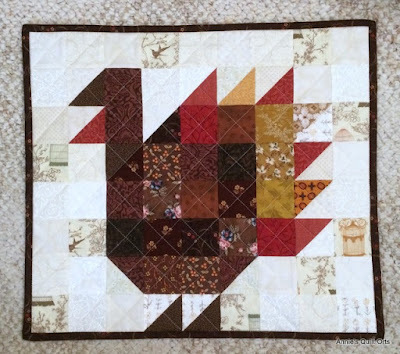 Last week I found this adorable turkey wallhanging while visiting our weekly linky parties. Annnnndddd even better, it led me to a very "new to me blog": Annie's Quilt Orts. Welcome to Tuesday Archives Annie. I hope ya don't mind my sharing your adorable turkey. Linked up the turkeys strutting their stuff! Have a very happy Thanksgiving! Tummy rubs to Jackson and Cami! I'm seriously lacking in the turkey department, perhaps I should get busy and fix that!! Never made a turkey in fabric, but have enjoyed viewing the ones posted. Happy Thanksgiving Valerie. I have spent time recently trying to find some turkey blocks I made. The studio ate them. burp.